Clara, Texas, Wichita County ghost town. German immigrant Herman Specht married Clara Vogel in Galveston and invested in land in Wichita County. Clara was a wealthy widow and the land holdings eventually exceeded 20,000 acres. Specht advertised for immigrants already in the US to move to Clara where he planted a nursery and laid out the town's streets in 1886. A drought in 1891 wiped out the grain crops and nursery and the Galveston Storm of 1900 wiped out the couples other investments. The Post Office closed the following year, but reopened from 1921 to 1925. The Clara school merged with the one in Burkburnett and affordable cars took families to work in Wichita Falls. 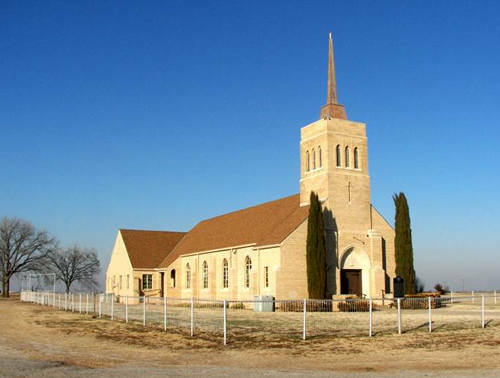 Today, the Lutheran Church remains, with few to celebrate its 100th birthday on the year 2000. The rectory is occupied and the cemetery is full of iris. 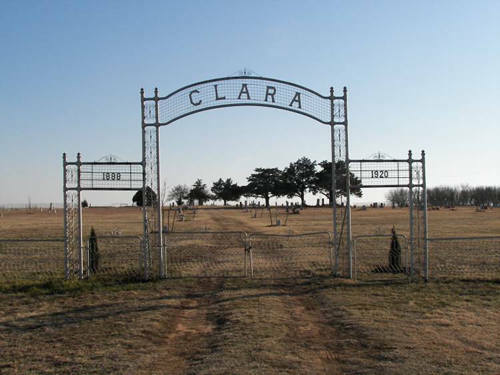 The cemetery can be reached by the Clara Cemetery Road which is entered just south of the church driveway on FM 1813 or off of Hwy 240. Herman Specht did not realize he would help open church doors. These doors have remained open for 105 years and with the grace of God they will remain open for another one hundred years. Mr. Specht left Germany in 1875 to avoid World War I. He was a man with foresight. He invested his money, purchased land in Galveston, Texas and married another Clara Vogel. Mrs. Clara Vogel Specht had access to more money for Mr. Specht to invest. 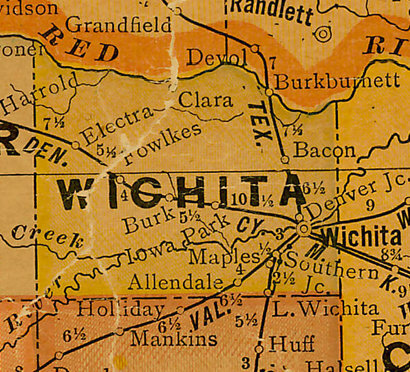 Thus the Specht�s began acquiring land in the northern part of Wichita County. Their land holdings grew to approximately 21,000 acres. Col. Specht envisioned a town and he wanted this town named after the love of his life, Clara. 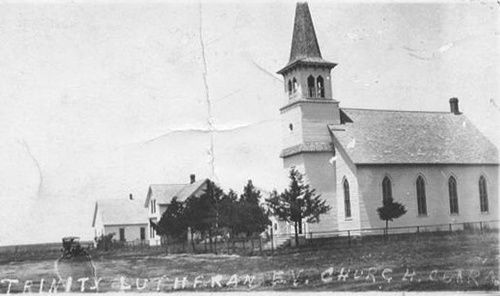 Township was established on April 24, 1886.
Letters were sent to newspapers (many of them printed in German) in Missouri, Minnesota and elsewhere for stable and capable German Lutheran families to come and settle in the town of Clara. My Grandfather, Charles (Karl) Van Loh (vonLoh) was living in Minnesota at this time and read this news there. He and his brothers, Walter, Fredrick and he came to Clara to start a new life. My Grandfather told us he and his brothers had been beaten up several times when they went to town in Watseka, Minnesota for being German and at this time it was decided to change their names to try to reflect they were from Holland and not Germany. Thus von Loh was changed to Van Loh and my grandfather�s name changed from Karl to Charles. I do not know what his brother�s names were prior to being Walter and Fred, but I do know there were two sisters left in Minnesota and they came to visit when I was a small girl. I remember they were here on January 1, and the year had to have been in the �40�s, probably in the middle �40�s as I was not yet in school and my younger brothers had not been born at this time. There were only three of us, my oldest brother Richard James, and my younger sister Martha Ann and me, Barbara Janelle. My grandfather came to Clara along with his brothers and was allowed to homestead land on which to start new lives. My grandfather, after he had settled and had a house decided he needed a wife and his brother Walter told him of a young woman who had come from Germany to Missouri right after he had settled and started farming. This young woman was to be my grandmother, Martha (Marta Katharina Mueller) Katharine Muller. They were married for over 50 years before she was taken to live with God in 1957. They had nine children, my father Victor Henry William Van Loh, Harold, Mildred Van Loh Counter, Nelda Van Loh Logan, Loretta Van Loh May, Viola (middle name unknown to me) who was hit by an automobile in downtown Wichita Falls, Texas when she was 13 years old and killed instantly, Helen Van Loh Tollette, Raymond Van Loh and the baby who is the only remaining sibling, Irene Van Loh Siegley. The Clara Township grew rapidly as the German families began to arrive. Among the earliest arrivals was the Ernest E. Goetz family. Goetze was born in Germany, grew to manhood there and was called to defend his native country in the two wars mentioned earlier. Determined to leave the strife torn country, he cast his lot with America and landed in Texas with his family in 1884. They stopped in Sherman and came to Wichita County a year later, where he bought a half section of raw prairie land and built his home. He later purchased enough land to give each of his children a farm. His two daughters, Lena and Frieda, who I knew from the moment I was a small girl remained at home with their father until his death in 1936. He was a faithful member of Trinity Lutheran Church and present at practically all services during the active period of his life. All young people who belonged to Trinity Lutheran Church belonged to the young people�s society, the Walther League. We collected money for Christmas sacks to be passed out the younger children after the Christmas Eve church services every year as well as going Christmas caroling. This was always a special night and we would always save the Goetze girl�s house until the last stop knowing they would have every kind of candy, cake and cookies with hot chocolate ready for us to enjoy and that we did. We were the first habitat for humanity, as we would go to the older people�s houses and paint their houses; repair tears in screens and whatever needed doing. This way, we were always given money at Christmas with which we purchased apples, oranges, bags of nuts and candy to fill each bag with. If you every to Clara, there is a basketball, volley ball court in the back of the church in which my brother Richard and I participated in building. I hope you enjoy reading this most from my memory and some from the history of the Clara taken from the history book at Clara. By Ray Johnston and Edith Johnston-Hall. They grew up in Clara. 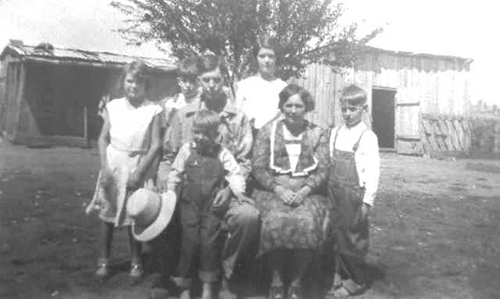 My Dad went to school in Clara and was one of the students along with his brother Harold and sister Mildred who were transferred from the school in Clara when the consolidation with Burk was done. I can remember my brother and I going to the grocery store just to the East of where the church now sits, and how it looked. Eventually, the store was torn down with the help of my Dad, as it was falling down and us kids would not stay out of there, and I went to Sunday School in the school house and can remember it well. I also attended Sunday services in the old church and remember when they actually got electricity. We kept the old pump organ for a very long time, you could never estimate when the electricity would go off, and finally sold it to someone when the new church was built, which my Dad helped build. My husband and I still attend services there on Sundays. I remember on Christmas Eve service, while still in the old church, the electricity went off and there were still oil lanterns along the walls of the church, so they were lit and even the candles on the tree were lit, probably not a good idea, but it was forever stored in my most treasured memories of my years growing up. I can picture that evening still today. We still use the originally baptismal bowl that was used in the old church and is over 100 years old. I will add memories as I can remember them and send them to you. I have a picture of a class of students including my Dad, his brother Harold and my Aunt Mildred taken beside the old school house. It was taken when my Dad was six and Harold was five and Mildred could have only been four years old. There is a lot of history at the church and it is very pleasant to go through it and remember some of the people I knew and who are buried in the Clara Cemetery.